LESLIE D. MICHELSON is the founder, chairman, and CEO of Private Health Management, a unique patient-focused company dedicated to helping individuals and corporate clients obtain exceptional medical care. He is a highly sought-after expert who has spent the last thirty years guiding thousands of people through our complex health care system. Prior to founding Private Health Management in 2007, Michelson was the CEO of the Prostate Cancer Foundation. He received his B.A. from Johns Hopkins University and a J.D. from Yale Law School. He lives in Los Angeles with his wife, Beth. "The decisions you make about your medical care will have a profound impact on you and your family's life.... Successfully steering through the medical system can be a challenge. 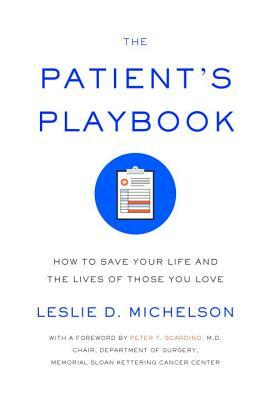 In The Patient's Playbook, Michelson gives away secrets of the trade—lessons he's learned from more than thirty years of helping people get better outcomes.... He levels the playing field by providing average patients who have ordinary health insurance with the resources, advice, and tools they need to make better medical decisions.... As a patient, you have more power than you think. This book will help you find that power and use it to maximum advantage." "What a tour de force! Every health care consumer (and caregiver) can greatly benefit from this practical guide to achieving better health outcomes. Simple, actionable advice abounds, and each recommendation for how to best navigate the complex health care system is enriched with Leslie Michelson's recounting of poignant stories from his extensive experience. With this playbook, all of us can better protect our most valuable asset--our health." "Trust me—you need this guide because everyone at some point faces a health crisis. Michelson details, step by crucial step, how to navigate the terrifying world of doctors, hospitals, second opinions, drug trials, and insurance so you get lifesaving results." "Michelson implores patients to be intensely involved in their own care.... He urges patients...to 'bring their A-game' to the doctor's office...advocat[ing] smart care, not more care." "In this unique and useful book, [Michelson] maps out a plan to organize competent medical care when needed.... He provides advice and resources that help individuals become medically prepared, make sound health-care decisions, and more likely achieve favorable results.... An invaluable resource, The Patient’s Playbook can effectively assist individuals in navigating the complex and often overwhelming world of illness." "Unlike most how-to books, this one is thick with advice and instructions....what's at stake: Your need to obtain the best possible diagnosis and treatment from an expensive but fractured netowrk of health care providers....The steps Michelson offers for negotiating the system mirror what his company does for patients—finding top experts and coordinating care....his insights about the importance of getting your caregivers to notice and talk to you is invaluable." "A primer on making the right moves as an active participant in your health care.... Michelson is the CEO of a company that works with patients to get the best possible care—not only from the best possible physicians...but also through guiding guiding them through the process described in this book, one that shifts the role of care director over to the patient....with this useful book, patients can have more say over what direction treatment takes rather than just going along for the ride."